E bought huge pumpkins this year: 10.9kg and 9.5kg. We rushed through carving while the grandparents kept the kids occupied, but they still turned out pretty nicely. Free babysitting, so we found a concert to go to :) First time at the Fox Theatre, it's an amazing venue. Standing was sold out so we had to settle for seats, but it was still good. Naked and Famous were great, and The Colourist were also really good - highly recommend their LIDO EP. After 5 days on the north shore, we relocated down to the more touristy south shore, mostly to see Waimea Canyon. We stayed at the Kiahuna Plantation Resort, and took in some waterfalls on the way down the coast. Waimea canyon continued to impress from the ground, and is well worth the trip to the southern side of the island. View from the Pu'u o Kila overlook, end of highway 550. At this point we are actually quite close in straight line distance to the start of the Kalalau trail! A few interesting hikes left from the Pu'u o Kila overlook down the Pihea trail that I wish we'd had time to do. These alone would take most of a day, and we'd already spent almost an entire day ogling the canyon. 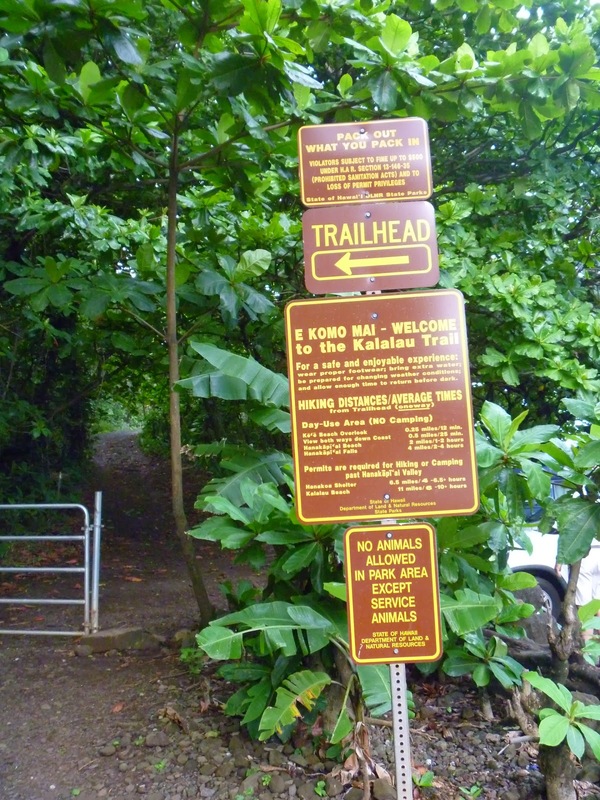 The Kalalau Trail, a TODO item! Having flown over the Na Pali coast the day before, I wanted to walk it. The Kalalau trail is one of the most famous walks in the world, and the only land access to the Na Pali. We hoped that a couple of days of mostly rain-free weather was enough to have dried the trail out somewhat. You start the walk at Ke'e beach, one of the best beaches on the whole island. The great beach plus the popularity of the trail means parking is a major hassle. There is a small turning circle and a tiny carpark at the beach and trailhead, but you'll likely have to park in the larger carpark 0.3 miles back up the road. The trailhead is well-marked but the sign is inaccurate: it claims permits are required to hike past Hanakapi'ai, but this is no longer the case. As of Jan 1, 2012, permits are only required for hiking past Hanakoa (at which point it is really an overnight hike). We decided to hike all the way to Hanakoa. We knew it was going to be a big day, so we carried a fair bit of water, food, and were on the trail by 9am. I'd definitely recommend carrying water purification tablets to give yourself the ability to re-supply: there are multiple large creeks/rivers. Hat and sunscreen are mandatory, and be prepared for brutal heat and humidity. While hundreds of people hike to the first beach (Hanakapi'ai) each day, and a reasonable number head 1.8 miles up the valley from there to see the waterfall, almost no-one day-hikes to Hanakoa. We were literally the only people without overnight packs who went any significant distance past Hanakapi'ai for the entire day. Trail as it passes Space Rock. You can clamber around the side via a precarious path for fantastic views. On our helicopter trip our pilot claimed the Kalalau trail was "the most dangerous trail in the world". This has no basis in reality. The biggest danger is the heat (we passed someone on the way back who was really struggling). The trail is fairly exposed, but not in a scary way, just in a the-views-are-amazing way. The trail condition was good, not too muddy, although we noticed the section closest to the trailhead deteriorated drastically over the course of the day from the hundreds of people doing the short version of the hike. The 13 mile round trip to Hanakoa took us 7 hours (half the time suggested on the trailhead sign), but it was a pretty epic day. There was plenty of elevation change and the heat and humidity were brutal, with little shade for most of the walk. We set a pretty quick pace but didn't rush the experience and took plenty of photos. Doing it with an overnight pack would be fairly tough work but something I want to come back and do. I think the best itinerary would be to do both waterfall side trips (Hanakapi'ai and Hanakoa) on the first day and camp at Hanakoa, have a short walk the next day to Kalalau, then come back in a single day. Best of all we got to soak our bones and wash off the mud in the warm water at Ke'e at the end of the day and watch a great sunset. Fantastic Ke'e beach. This was my favourite beach on the whole island. Beautiful, and kid-friendly water and shade. We started by heading for Mount Wai'ale'ale, a shield volcano crater, billed by the local tourist industry as the wettest place on Earth (I thought it was a place in India that gets monsoon rain, which is closer to the truth, but "wettest" is hotly debated). In any case, watching the water cascade down the wall of tears is an impressive sight. We threaded the needle with the weather: enough rain that every single waterfall was operating, and just clear enough of clouds to actually see it. Without large bodies of water to feed the falls many of them dry up less than an hour after rain. Our pilot had only seen all the falls operating a handful of times, despite hundreds of flights. Look like the set of Jurassic Park? That's because it is. Manawaipuna (Jurassic Park) falls. Waimea Canyon: "Grand Canyon of the Pacific" isn't overselling. Once we were done with the helicopter, and swapped kid-minding duties so the rest of the family could go, we went and hung out at the fanciest hotel on the island: the St. Regis in Princeville.